Last time I talked about talking to my dogs. This time I want to talk about listening and more importantly hearing what they have to say. Dogs are non verbal species. This means that they can only tell us things by their behaviour. It is easy to miss the conversation altogether if you aren’t paying attention and this is an important component of having a successful relationship. Dogs and other non human learners have a lot to say, if we just listen. This morning when I woke up, D’fer, my elderly Chesapeake was in my room, lying by the bed and panting. And panting and panting and panting. As I became more aware of the day, I tuned into him and I could see that he was obviously in distress. As a non verbal species, it is really tough to figure out what was distressing him, but I can make some good guesses. He is old and often painful, so a good guess is that he was in some pain this morning. He had a heart murmur that resolved, but it could be that he is having heart issues again. We have had a pretty significant weather change today, from cold and wet to hot and humid, so maybe that is what is going on. Noticing what he is doing, I have some choices; I can get up and see if he needs some pain meds, or I can roll over and go back to sleep. Imagine for a moment that this was your spouse and you woke up and he or she was breathing heavily, and obviously in distress. What would you do? Perhaps waking him up and checking in might be a good idea. Or perhaps you know that your spouse normally breathes like this in the morning and you just need to nudge him to roll over and you can both have a lie in. What about if this was a newborn? Or your aging grandfather? Knowing something about those who surround you is an important part of “hearing” what they say. The above example is one where my dog’s behaviour was not one of choice and it is up to me to first off notice and secondly to choose the right action. The action I took was to get up, toilet him and get him his meds. He is on daily pain medication and he needed his next dose. Not all of what the dog tells me is because of his physiology though. Some of the dog’s behaviour is about things that he wants or needs. 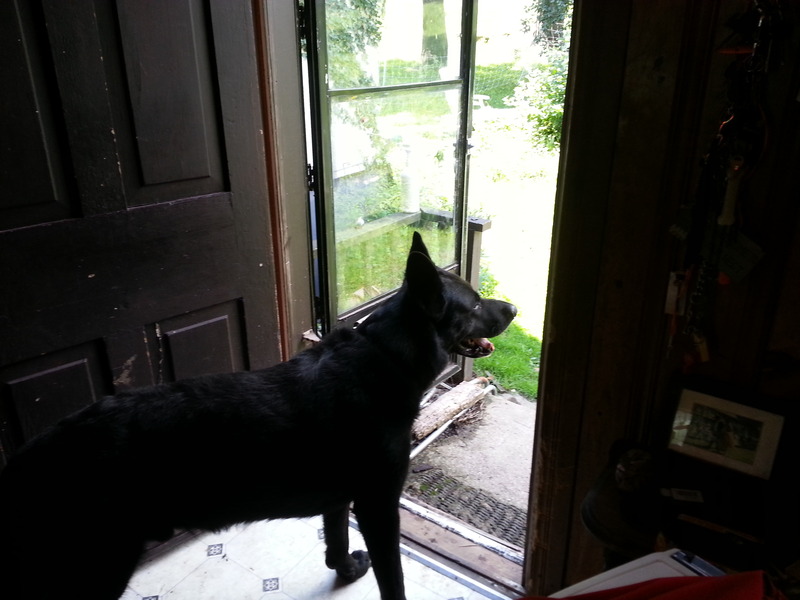 When Eco my German Shepherd goes to the gate and looks out at the geese on the pond, I know he would like me to open the gate so that he can go chase geese. He will stare longingly at the geese through the gate, look back at me and then look back to the geese. If I open the gate, he will chase the geese into the sky. Eco thinks that chasing geese is terrific. If it is fall and the geese are not nesting, or if it is spring before the geese nest, I sometimes let him do this as it prevents the geese from eating all of our pasture. If the geese have goslings though, I will tell him that it is not his turn and he will sadly turn away from the gate. In effect we have a conversation, where he tells me what he wants and I tell him if he can have it or not. My dogs have ways to tell me a good number of things. Some of them are things that I have taught them to do and some of them are things that they have picked up on their own. If I am watching a movie, D’fer may come up and sit in front of me and if that doesn’t cause me to share then he will turn on his sad Chesapeake act and if THAT doesn’t work, he will rest his chin on my lap, because that almost always works. D’fer knows how to ask politely, and then with some emphasis and finally he will beg. He knows that I rarely refuse him if he is truly being cute! D’fer was trained to alert me to medical events; he would tell me if I was about to get a migraine or have a panic attack. Without getting into how we trained that, if the conditions were right for me to get ill, he would “tell” me by flipping my arm with his nose, or by putting his feet on my chest. He would tell me that I needed to take medication and I would do as told! This is more of a one way directive, but it is communication indeed. Today in one of my privates we were working with a dog who has some serious issues with other dogs. We were working to teach him that he can approach without losing his cool. A big part of what we do in that sort of exercise is to “listen” to what the dogs are telling us. Every time this dog would get too close to the trigger dog, he would give a big lip lick. This “tell” or piece of body language would let me know that he was as close to the other dog as he could get without losing control of himself. Listening to what the dog was saying helped me to know when to send the owner back to the safety station. Lip licking is one of a raft of behaviours that dogs do when they are stressed; called displacement behaviours. These behaviours tell us that the dog is approaching a threshold of some sort and that we need to slow down. 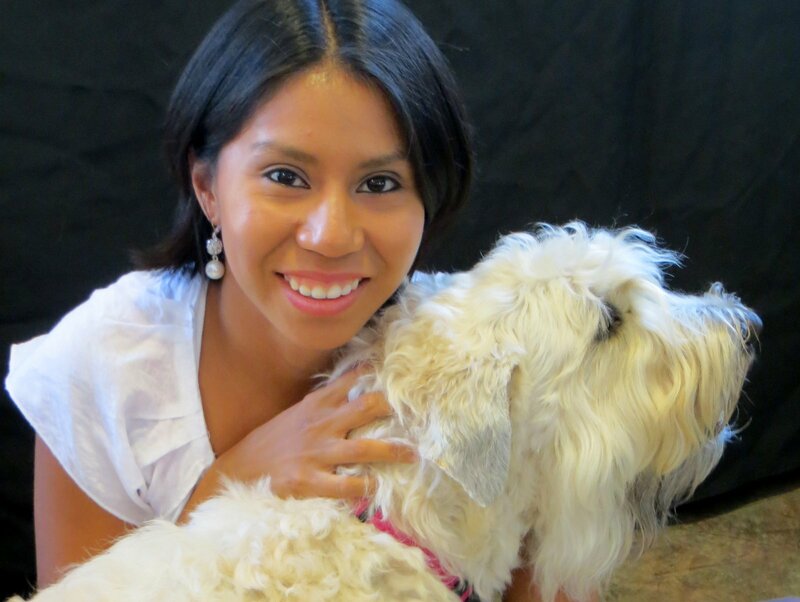 They can tell us when the dog is distressed or upset or when they need a break. Knowing your own dog and knowing how they tell you that they are over the point at which they are comfortable is an essential part of being successful with your dog. If you don’t respond when your dog is telling you these things, then your dog will think he has to face the world on his own steam. This degrades your relationship because your dog will learn that you won’t listen to him. I have successfully helped several people teach their dogs how to tell them that they need a break in more concrete ways. One dog on my caseload learned to say “Go/No Go” for taking treats from strangers. The concept was really simple, but the ability to communicate that is behind this concept is fairly abstract. First we taught the dog to touch a target. Then we established two targets; one for “Go” and a very different target for “No Go”. If the dog randomly touched the “Go” target, he got a treat. If the dog randomly touched the “No Go” target the person offering the treats backed off and took the treats with them. This dog, a Scottish Terrier named BJ, amazed his people because he would sometimes turn down treats that he normally really liked depending on who was offering the treat. This gave BJ the ability to say when he was ready for interactions with new people, and by being able to say no when he was not ready, he was able to expand the number of people he could tolerate both offering him treats and eventually touching him. Communication is a special ability that we can use with our dogs, if we are willing to be open to listening to what they have to say. We have to be aware of who our dogs are, what they say and how they say it, and then respond appropriately. Even if the response is “not now”, responding regularly and appropriately is an important way to deepen our relationship with our dogs. I am starting a new section on the blog where I am going to feature people I know who breed dogs carefully and thoughtfully to help people to learn a little more about who breeders are. Breeders often get a bad rap, but often they shouldn’t. I would like to share with people some of the questions that I think are important to ask breeders and get some answers from the breeders themselves. If you know a good breeder who consistently breeds nice dogs and who cares about where their dogs end up and what they dog throughout their lives, feel free to recommend a breeder to me. I will consider breeders of both purebred or mixed breed dogs as long as the breeders are the kind of caring folks who produce nice dogs and carefully select the families they go to. When families have options to get a nice dog and they keep that dog in their homes for the life of the dog, then we have a situation where dogs don’t get into shelters or rescues, and that is what I hope to achieve by helping people to better understand the process of breeding and raising great family dogs. 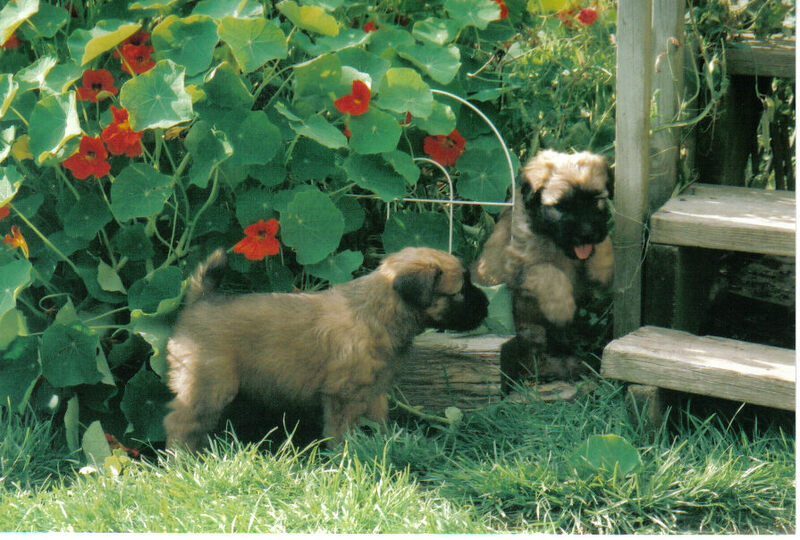 Dianne Mackie is a client who also breeds Soft Coated Wheaten Terriers. We have had a half dozen of her puppies in our classes, and we always enjoy them. They are delightful dogs who are great clowns and lovely pets. Here in her own words are Dianne’s thoughts on her breed! What breed do you breed, and what do you love about your breed? I have been loved and owned by Soft-Coated Wheaten Terriers since 1988. After much research, I chose Wheatens because they are a medium-sized, active dog originating in Ireland (where I grew up) and a good natured, all round family pet. They were an all purpose farm dog; owned by the poor – not a dog for the Gentry. I can say I made the right choice for myself and my family. Exuberant and enthusiastic are two words used to describe Wheatens. Full of character and personality, Wheatens are sweet-natured, affectionate and very people oriented. They thrive in homes where they are part of the family and are included in daily family activities. 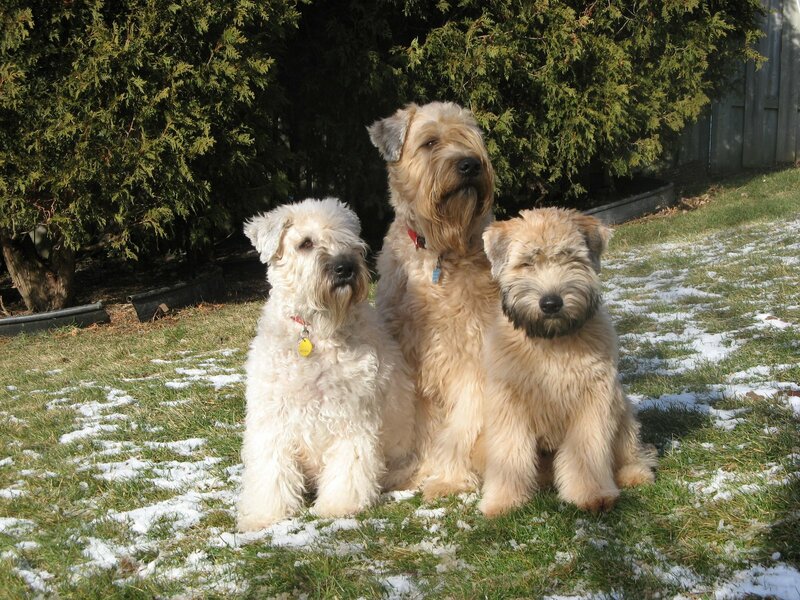 They are renowned for their beautifully soft, non-shedding coat which is a warm wheaten color. Wheatens do require regular brushing and grooming. Most people would not choose another breed once they have been loved by a Wheaten. Three of Dianne’s dogs! I have met these dogs and they are all friendly and easy going with people! What is the biggest drawback to living with your breed? I thought about this for a long time, and really could not come up with an answer. For me, there are no drawbacks but Wheatens are not a dog everyone, especially those who would like a little less enthusiasm and spirit! What do you do with your own dogs? I show my dogs in conformation. Flora, (aged 11), Will (9), and Maggie (5) are Canadian Champions. Shamrock, the youngest is ½ way to her championship. All our dogs have been to Puppy Socialization Classes followed by at least 2-3 levels of Obedience Training. My daughter enjoys taking Shamrock to Rally ‘O classes at our favourite training school -‘’Dogs In The Park’’ and she hopes to be ready to compete soon. My daughter and Shamrock love the weekly off leash walks also run by “Dogs In The Park”. The dogs get a long daily walk in the neighbourhood and take turns in accompanying us on trips and outings. Going to soccer games were one of the favourite evening activities when my kids were young. Flora always found a dog lover nearby who would pet her for the whole game, her head on their lap. When Maggie was 8 months, she travelled with us by car to PEI. She was a delight to travel with. 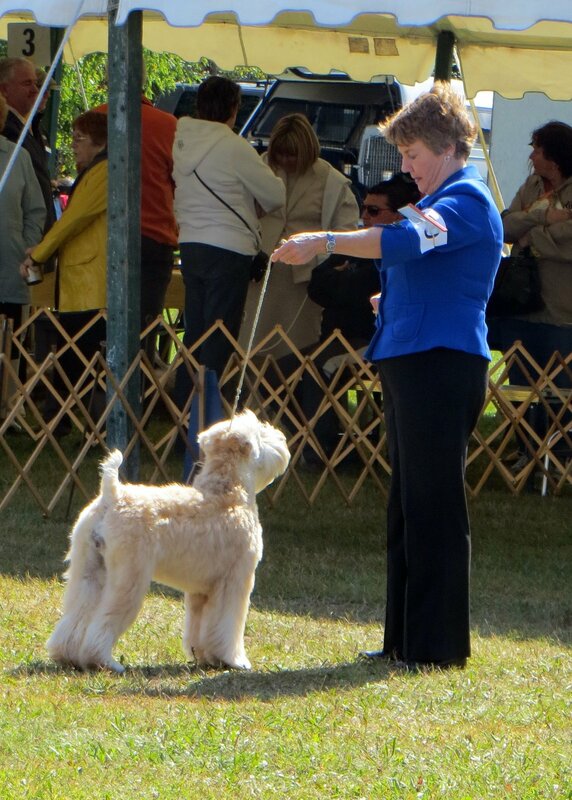 Here Dianne is showing one of her dogs in the sport of conformation. 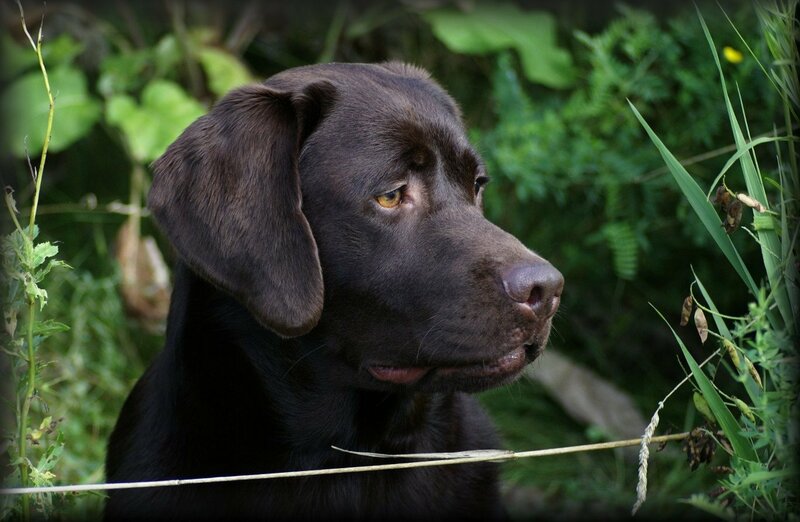 This sport is intended to help breeders to compare their dogs to a known and agreed upon standard. This is more than a beauty show though; the judge looks at the dogs and makes certain that they move normally compared to how the breed standard says they should move and does a preliminary health check. Males who have retained testicles are disqualified for instance because that is a heritable trait that can lead to significant health issues in the offspring. By eliminating those dogs who carry the gene for monorchidism (the veterinary term for a retained testicle), healthier dogs will be produced. Champions are dogs who have competed against a number of other dogs and earned points. When they earn enough points, they earn their Championship. In Canada the Canadian Kennel Club governs this, and in the United Stated the American Kennel Club governs this. If you look at a pedigree and it says CAN AM Ch before the dog’s name, then the dog has earned a championship in both countries! What do you hope your puppy owners will do with their dogs? First of all, my new puppy owners will have their puppies signed up for Puppy Socialization Classes before the pups leave my home. I can’t stress enough how important these classes are for everyone to get off to a great start. I encourage at least 2 levels of basic obedience training and more. It is a great bonding activity and can help manage a problem early before it becomes more serious. I want the pups to be a cherished family member and join the family in their activities. If introduced early to water, Wheatens love to swim and have enjoyed riding in a canoe and even surfing. Wheatens are becoming more involved in herding activities as they did round up the cattle in Ireland. I hope puppy owners will join our national Wheaten Club: The Soft-Coated Wheaten Terrier Association of Canada. (I am the Regional Director for South Central Ontario). There’s lots of great information in the 4 times/year publication and is a great way to connect with other Wheaten owners and activities. Puppies need lots of chances to explore and play and learn. These pups are too young for puppy classes, but they will learn and explore even more in a good puppy socialization class! If you could give any advice to people who are considering purchasing one of your puppies, what would it be? Do your research on the breed. Go to dog shows. Talk with many breeders. Find a breeder you like, respect and feel comfortable and who has time to spend with you. Ask lots of questions and you should expect the breeder will ask you about your family, lifestyle and how much time you have for a pup. Then get on their waiting list. You may have to wait for your puppy but it will be worth it. A good breeder will be there for support and advice for the duration of your dog’s life. Buying a puppy is not like buying a can of soup! 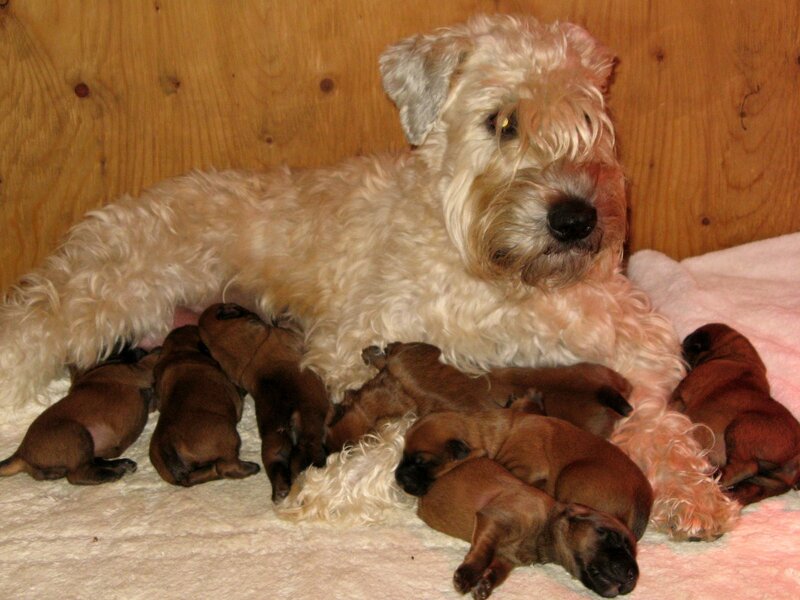 A good breeder often has a waiting list and will match the right pup to the right family. A waiting list is one sign of a good breeder. Find someone who can work with you over time. If you are able to get to know the breeder ahead of time, then you will have a lasting relationship that will help you to be successful with your puppy throught his or her life. What advice do you have for families with children who want one of your puppies? First, I want to meet all the children to see the family dynamics, how they behave and interact with dogs. Parents need to have time and energy for the pup and the amount of work a small puppy involves. Having a puppy is almost as much work as having a new baby. I want to make sure they understand that, though it may be Johnny’s puppy, the majority of responsibility needs be theirs. I want to know that the children will be involved in Puppy Socialization classes and the dog’s training classes if they are old enough. Children should sit down to hold a puppy. The puppy’s teeth are needle sharp. Just like children, puppies put everything in their mouths. Children should hold a toy in their hands while playing so the puppy bites the toy, not fingers. Look at your home from a puppy’s viewpoint to see what is safe and what dangers puppy could get into. Anything on the floor can be a hazard for the puppy. Puppy needs a safe place (crate) of his own where he can rest and not be disturbed. Wheatens are family dogs! Charlotte and Shamrock train in Rally O and are getting ready to compete. Do you have any advice about living successfully with your breed? Keep them stimulated physically and mentally. Have rules. Be firm but fair. Love and cherish their unique personalities. Lots of positive reinforcement and praise. They just want to be with you so do not leave them alone for long periods. Make provisions for them during the day if you are working outside the home. Small puppies should not be left alone for more than one period of 2-3 hours in a 24 hour period. Understanding that each dog is an individual with unique likes and dislikes can help you to find interesting things to do with your dog. 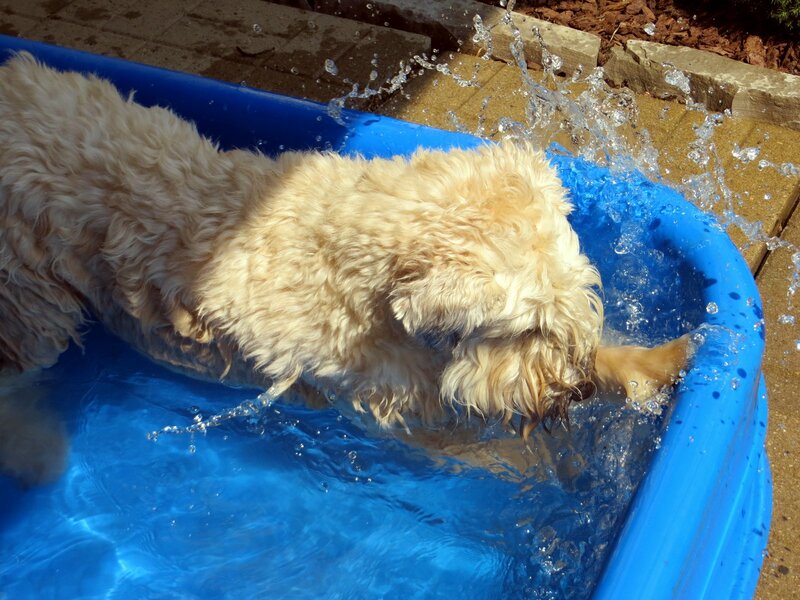 This Wheaten loves the water and is playing in a pool in the yard. Enjoy the clownishness of your dog and he will reward you with ever more creative activities. Do you have any additional comments you would like to share with new puppy buyers? If you want a good night’s sleep, then place the puppy’s crate in your bedroom at night. When the puppy hears your breathing and movement, it won’t feel alone and abandoned. This way, you will only be up once in the night when the puppy needs out vs. listening to a lonely, distressed puppy crying all night in the kitchen. No, but check out the website of our national club for the newly revised “Puppy Buyer’s Guide”. Periodically, we run a guest blog that we call “Featured Breeder”, featuring breeders we have met who breed dogs we have met who really impressed us! This time we are pleased to feature Brian and Valerie Cooper, of Cooperslane in Arthur, On. We have met many of their puppies in our classes, and we have yet to meet one who was not an exemplary member of his breed. 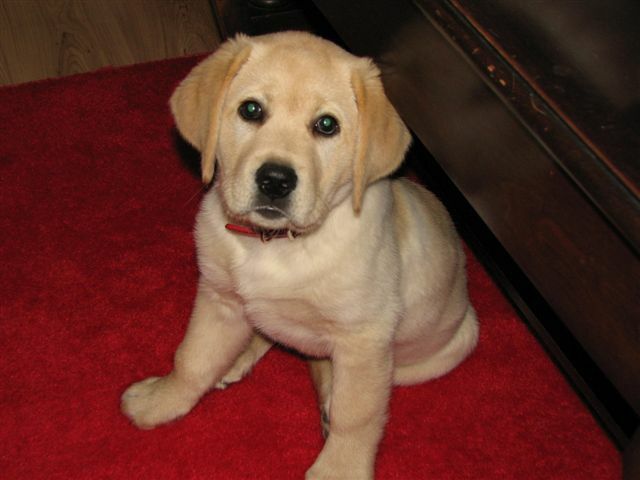 Tucker is a beautiful example of a Cooperslane Labrador puppy! The biggest draw back to living with this breed is their need for exercise and stimulation. They get into trouble if they aren’t properly exercised and because they are such a smart breed, they can quite often ‘out think’ their owners. 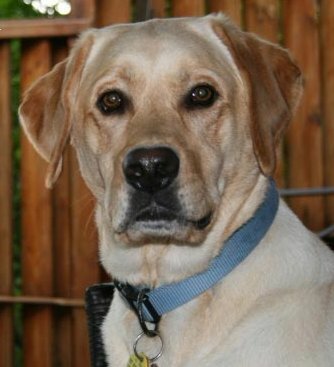 Our labs are very often used for Service Dog Organizations. We work closely with Autism Dog Services out of Cambridge. Just weeks ago we were invited to a graduation and we were very proud that four out of the six dogs that graduated were Cooperslane labs. Some Cooperslane dogs have gone on to careers as service dogs! In the past I have tried Confirmation Showing but it just wasn’t my cup of tea. I then tried obedience and found that very enjoyable. Through this obedience training I came to work with, at one time four different Service Dog Organizations. 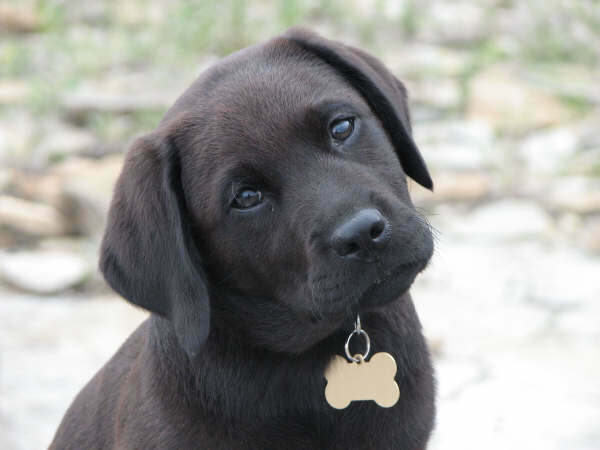 We hope new owners will first and foremost have their labs as a big part of their family. We really encourage obedience training as soon as possible after picking up their pup. If our owners want to try obedience, show, therapy dogs or field trials that would be wonderful but first we just want them to part of their family. There’s nothing better than sitting on your porch with a cup of coffee and your lab by your feet enjoying the end (or any part) of the day. People considering one our labs must be aware of the time commitment in raising a puppy, especially the first year. Its a lot of fun but there are also LOTS of moments of pure chaos. A huge amount of training and exercising goes into making a good companion dog. Plus families need to realize it’s a long term commitment. These dogs are not disposable. We really encourage crate training and getting the puppy into a qualified training facility as soon as possible. Plus, I’ve found the more you read and prepare yourself for the arrival of the puppy the better. When families visit here for the first time they are given a video outlining the basis knowledge for when you first bring home your puppy; how to start the housebreaking, how to begin crate training, how to deal with the nipping and biting, etc. Then when the litter is six weeks of age we also email the families with reservations our ‘Cooperslane Puppy Package’. It’s about 40 pages we put together over the years with information we feel is important for the families to have before they bring home the puppy. The better prepared you are before the pup joins the family the easier it is to deal with issues that will arrive. We also give suggestion of other books and literature to read. Puppies need to live with their families in the house. We look for families that will give our puppies a nice family environment. Our dogs are not meant to be tied to a doghouse. They crave human contact and will give back lots of love and affection. We do suggest to families with small children to step back and make sure their child can handle adding a puppy to the household. Small puppies treat young children as their littermates and therefore can traumatize a child. They only way pups first know how to play is with their mouth so there is a lot of biting and nipping which can really hurt. The puppy needs to be taught how to play properly and it’s hard for a young child to grasp that. Plus the new families need to realize their children being used to ‘dogs’ is not the same as their children being around ‘puppies’. In the first initial correspondence I have with the families, I caution families with young children. To live successfully with the breed is to know going in that the time comment can be huge especially the first couple of years. Lots and lots of exercise and lots and lots of training. 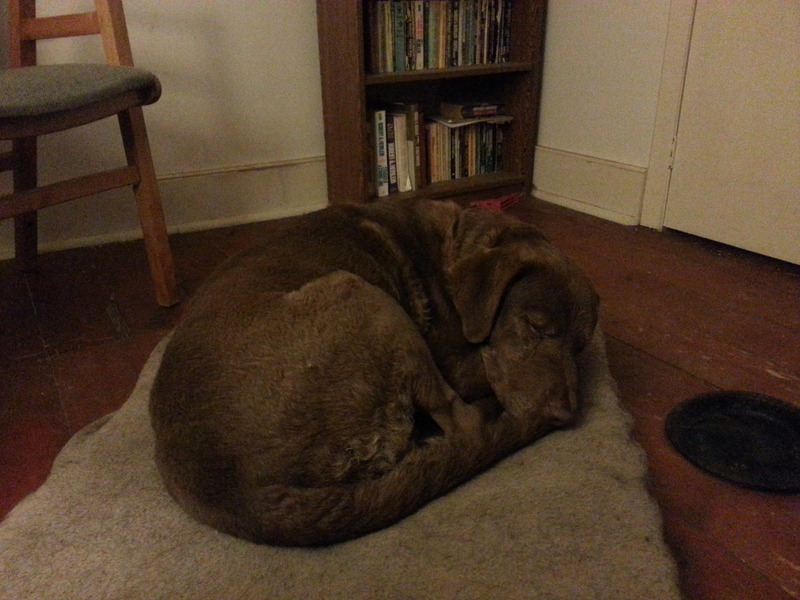 (A tired dog is a good dog). It takes dedication to have a good companion dog. Also families need to realize the financial commitment to having a lab (or any dog). Labs LOVE to play and they play rough. They think they can do anything and sometimes they injure themselves. Labs also love to eat… EVERYTHING! Those vet bills can be brutal. We always encourage families to consider carrying health insurance on the dogs and offer several websites they can research. As most of our litters are sold before they are born or shortly after we invite families to visit. That is for our peace of mind but we also realize families need to feel comfortable with us, to check out our facilities and meet the dogs. The Labrador needs a lot of attention and exercise to grow up to his full potential. We put pictures of the puppies on our website (starting on the Monday following their birth) and update the photos every Monday afternoon. This allows the new puppy owners to see the growth of their new family member right from “day 1”. Lots of our new puppy owners have a scrapbook of pictures even before the puppy is taken home. When the puppies are four weeks old we invite the new owners to come for a visit and a cuddle. We have a ’48 hour wait’ period here. What this means is that if, when you visit the kennel, you fall in love with a pup that is eight weeks of age or older, you will not be able to take the pup home with you that day. As mentioned above, most of our pups are sold well before they are eight weeks of age but sometimes families have to back away from a reservation for personal reasons. When this happens, that pup becomes available. The families interested in that 8 week old pup are asked ‘wait 48 hours’ before picking the puppy up. This, we feel helps eliminate impulse purchasing of a puppy. Plus, it gives you time to prepare for the puppy (crate, food, dishes, chew toys, etc.) We also like to email our “Puppy Package” to the families to read BEFORE they pick up their pup. We like the families to know about our ’48 wait period’ ahead of time so they aren’t disappointed that they aren’t able to take the puppy home with them that first day. We do have a website that update constantly. Please visit us at www.cooperslane.com plus we have a Cooperslane Kennel Facebook page.